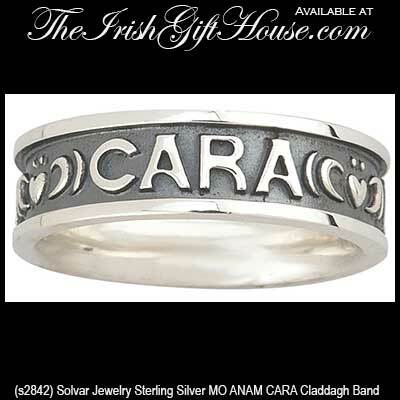 This women's sterling silver Claddagh wedding ring features the Irish words MO ANAM CARA embossed on the band. MO ANAM CARA are the Irish words for My Soul Mate and they are found embossed on this sterling silver Claddagh wedding ring for women. These three words are separated by the Claddagh symbol and the 1/4" wide band is enhanced with an oxidized background. 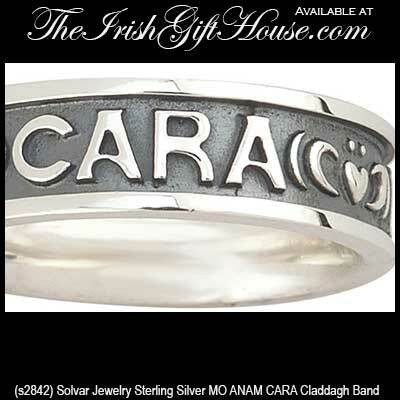 The MO ANAM CARA band is made by Solvar Jewelry in Dublin, Ireland and it is gift boxed with a Galway Folklore card that explains how to correctly wear the Irish ring along with Celtic knot and Claddagh history cards that are complements of The Irish Gift House. This Claddagh wedding ring is available in full sizes 5 through 10. This men's sterling silver Claddagh wedding ring features the Irish words MO ANAM CARA embossed on the band.